This May, Wellington libraries will turn into temporary concert venues – showcasing young local talent. Up-and-coming young artists will perform afternoon gigs at Wellington Central Library and at the Ruth Gotlieb (Kilbirnie), Newtown, Johnsonville and Karori branch libraries. These free events will take place Monday 16 to Friday 20 May. There will also be evening performances at ZEAL and The Jimmy Bar at the St James Theatre. Wellington City Council is organising these live performances in partnership with Play It Strange, a trust established in 2003 to encourage young New Zealanders to develop interests and skills in songwriting and musical performance. Other Music Month events include a series of Music Workshops. 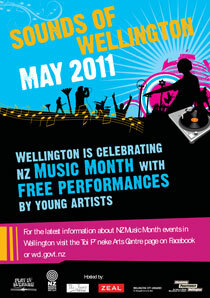 On Monday 30 and Tuesday 31 May Toi Poneke Arts Centre will hold free workshops for independent musicians. The workshop on Monday is for musicians who want to break into the Australian market and will be full of hits and tips for people who have already crossed the Tasman. This is followed on Tuesday with the launch of the Instrumental’s Musician’s Publicity Toolkit – with a live performance from Mara TK. The toolkit is a musician’s essential guide to self-publicity and online marketing.